"This session is typically used at the start of a process improvement effort in order to get an overview of the existing process as well as identify where best to apply improvements. Use this session when you want to widen the scope of an improvement effort so that everyone becomes aware of the “big picture” (strategic) approach." The focus is on software development, but this simulation is applicable to any Lean roll-out, since it focuses on the Theory of Constraints, identifying bottlenecks and improving flow. 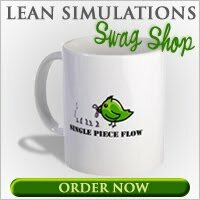 I've added this game to my collection of free lean games and simulations. For more information on the Theory of Constraints, check out the book, The Goal: A Process of Ongoing Improvement . Written by Eliyahu Goldratt, it's one of the pillars of lean, dealing with the Theory of Constraints in a fictional fomat.